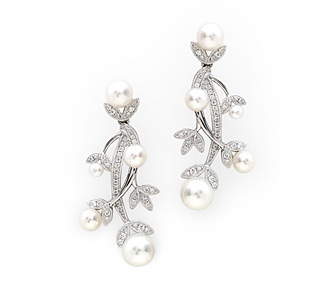 Experience “buds” of pearls and “leaves” of diamonds in the Budding Diamond Pearl Earrings inspired by the organic shapes found in nature and the perfect jewelry set match to Budding Diamond Pearl Bracelet and Necklace. A complete fine jewelry shop! Diamonds: .35 TW | Gold: 18K White | Length: 1 3/8 in. | Width: 5/8 in.